U.S. Blocks Chinese Company's $1.2 Billion Takeover Of MoneyGram : The Two-Way The rejection comes despite Chinese billionaire Jack Ma's attempts to form ties with the Trump administration; he visited Trump Tower in January of last year. 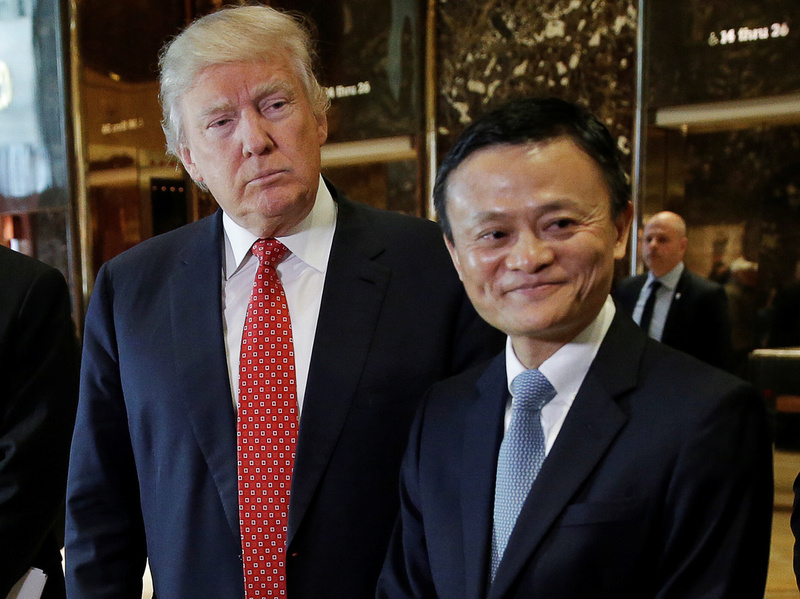 Alibaba Executive Chairman Jack Ma visited President-elect Donald Trump in January of 2017, as his company was launching an attempt to buy MoneyGram. Chinese billionaire Jack Ma's yearlong effort to buy U.S. money transfer company MoneyGram is now over, after American regulators objected to the $1.2 billion deal. Ma's Ant Financial Services Group has dropped its bid for the Dallas-based company. Announcing the spiked merger, MoneyGram CEO Alex Holmes said, "The geopolitical environment has changed considerably since we first announced the proposed transaction with Ant Financial nearly a year ago." Holmes added, "Despite our best efforts to work cooperatively with the U.S. government, it has now become clear that [the Committee on Foreign Investment in the United States] will not approve this merger." The CFIUS, a unit of the Treasury, has not provided its reasons for rejecting the deal. In Hong Kong, the South China Morning Post says it's a sign of "a political climate that is not welcoming to Chinese firms." The rejection comes despite Ma's attempts to form ties with the Trump administration; he visited Trump Tower in January of last year. "MoneyGram shares fell nearly 7 percent in after-hours trading following the news," NPR's Rob Schmitz reports from Shanghai. "Ma, the founder of Alibaba, the world's largest online commerce platform, met with [President-elect] Trump last year and said he could create 1 million jobs in the U.S. by helping small businesses sell their products to the Chinese." The setback leaves Ma's Ant Financial Services Group to find other ways to reach its expansion goals. MoneyGram has important partnerships with retailers such as Walmart and CVS. The company claims 30,000 locations in the U.S. and more than 350,000 in countries around the world. The failed merger would likely have given Alibaba a strategic edge in one facet of its rivalry with another Chinese tech giant, Tencent. It would also have signaled America's receptiveness to forming new and close economic ties with Chinese businesses. "U.S. companies active in China should be wary of repercussions," The Financial Times says in an analysis piece. In making a deal to buy MoneyGram, Alibaba had won a bidding war with Kansas-based Euronet Worldwide. In the end, MoneyGram accepted an offer from Alibaba worth $18 a share, beating out Euronet's price of more than $15 a share. MoneyGram's stock closed on Tuesday around $13.30 — but it fell as low as $12 overnight. Tuesday night, Euronet issued a statement saying that while acquiring MoneyGram is still backed by "compelling commercial logic," the company would not guarantee a new offer would be made.